Productivity encompasses so many different facets of our businesses and lives. It impacts our most precious resource time and is influenced by so many factors that it’s almost impossible to identify all of them. Factors impacting productivity can vary from hour to hour, day to day, task to task, what you had for breakfast, down to the temperature of the room and the way the sun is shining, plus several 1000 other variables. So what’s my point? That’s it’s up to you to figure out YOUR productivity formula. Most of it comes down to you making the decision to prioritize figuring out what is working and not working in your day to day life, both on the business & personal side. And if you work from home or you are a solopreneur these two sides can easily blend and have an enormous impact on each other. Even if you have a 9-5 what you are doing on your personal side can certainly impact productivity too. Improving productivity is worth the investment, but it does take work and effort. 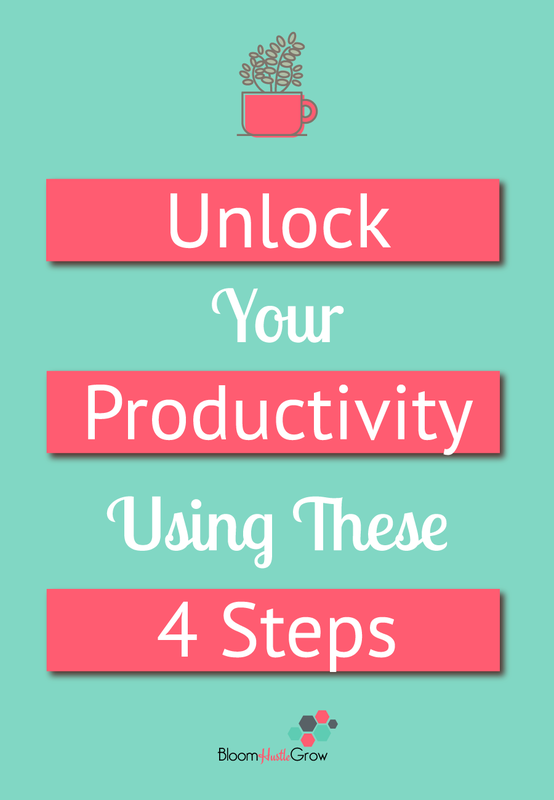 I’ve outlined 4 steps to get you started working on your productivity. Prioritize finding your productivity formula to make better use of your days. Do you struggle with lack of focus? OR _______(fill in the blank). Often we will struggle with all of these because they are very intertwined. The key is to tackle the big one causing the most strife. What seems to be a day to day struggle, and appears to be causing you the most problems? What about your day to day seems to be impacting getting your work done the most? You then build from there, and because they are intertwined, you will eventually work to address more problems associated with your productivity as you move towards building your formula. But the good news is that establishing routines/habits/good practices and simply teaching yourself to take notice will help you make your productivity formula to be stronger and stronger. I wanted to share a formula that I came across recently from a post by Charlie Gilkey on the Productivity Flourishing website. While I wish as easy to pull in some variables to fix the problem of productivity, this nicely demonstrates how interconnected and complicated the productivity formula is. Figuring out what works for you to build productivity is not a set and done solution. It’s a process that you have to continue working at. What’s the next step in starting any experiment after identifying the main problem? RESEARCH. Start trying techniques out! You don’t know until you try it out. You experiment with known and shared techniques and see how they work for you. By the way, because the problem of productivity is so intertwined with many variables, most techniques work towards addressing more than one productivity hindrance 🙂 Some of your productivity problems can even be solved just by recognizing that something is a problem and taking steps to avoid it. For example, realizing that tv is a distraction and if you write with the tv off, you finish a draft two times quicker. While we do improve our productivity over time, it’s not something that you can ever be solved completely. Having productive days gets easier as you apply more techniques and establish systems/habits/routines, but it is something you have to continue to monitor and address. You never know when distractions will start to creep back in and bad habits replace good. It’s kind of a lot like exercise, you have to keep working at it! Take my productivity quiz to help you get a jump on step 1 and get personalized feedback that will help you tackle your main struggle.